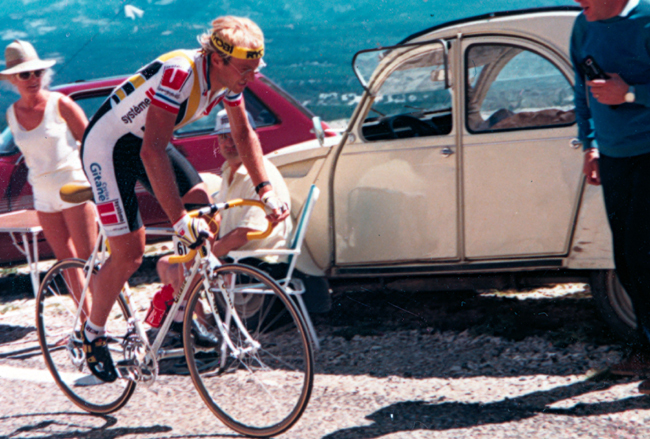 Laurent Fignon (August 12, 1960 - August 31, 2010) would get irritated when people recognizing him would say, "You're the guy who lost the Tour de France by eight seconds." His reply, "You are wrong sir, I'm the man who won the Tour de France twice." Fignon was a singularly gifted rider who could win both the Grand Tours as well as single-day classics. He won the Tour de France, the Giro d'Italia, Milano-San Remo and La Flèche Wallone. He had a prickly personality that earned him the nickname Monsieur Citron (Mr. Lemon). Fignon was discovered and signed by legendary director sportif Cyrille Guimard after he watched Fignon try to stay with Bernard Hinault in the 1981 Tour of Corsica. Guimard raced Fignon hard. In his first year as a pro (1982) riding for Renault-Elf, Fignon rode the Giro d'Italia, briefly holding the lead. The next year Fignon helped teammate Hinault win the Vuelta a España, which was then raced in the spring. When Hinault's knee problems kept him from riding the 1983 Tour de France, Guimard reluctantly entered 22-year old Fignon, hoping for stage wins or perhaps best young rider. 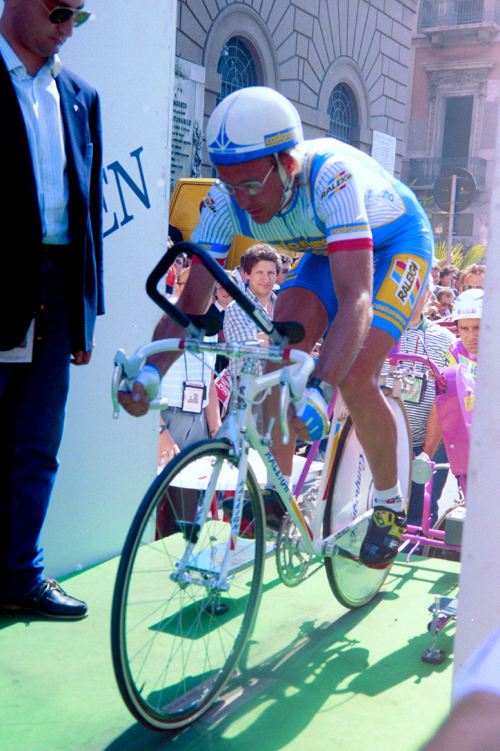 Fignon won the Tour after stalking leader Pascal Simon, who was trying to win with a broken shoulder blade. When Simon inevitably abandoned, Fignon was there to take the Yellow Jersey. The next year, 1984, probably saw Fignon at his physical peak. 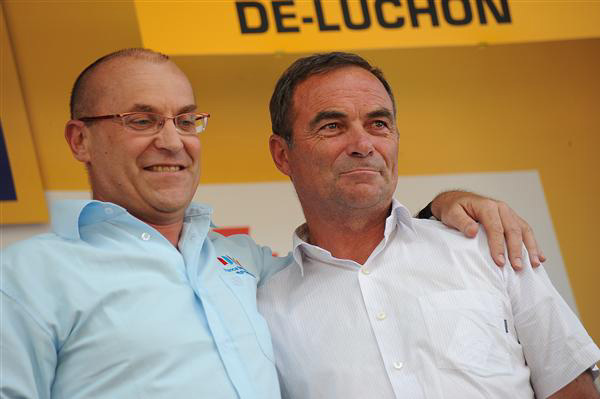 He effortlessly trounced Hinault, his only real challenge to winning his second Tour. Before that repeat Tour win, Fignon came in second in the Giro to Francesco Moser. Fignon remained bitter about that Giro. 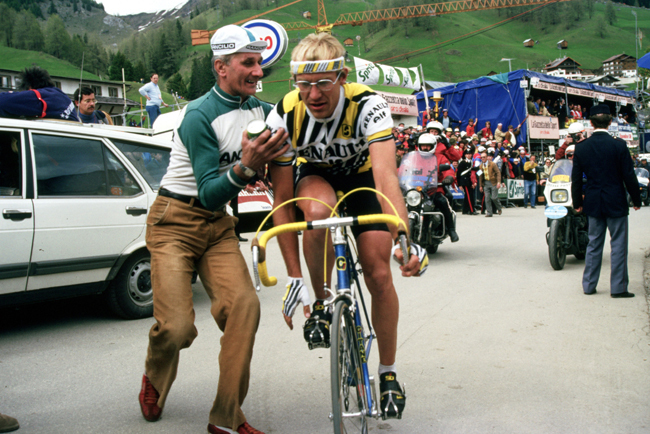 He said the officials wanted an Italian winner and had connived to help Francesco Moser win. After a mysterious stage cancellation that favored Moser and some dubious officiating that aided Moser and penalized Fignon, the Frenchman was still in the lead going into the final time trial stage. There, Fignon insists the television helicopters flew in front of him to create a headwind and behind Moser, pushing him along. Moser vigorously denies these allegations. 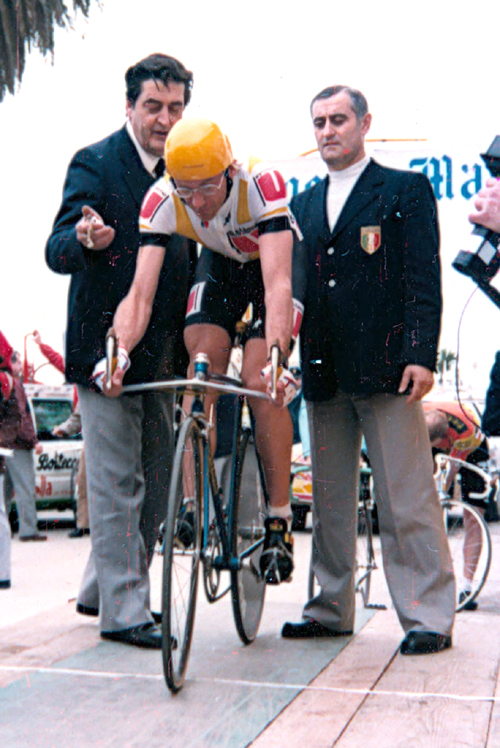 Moser won the time trial and the 1984 Giro d'Italia. Fignon, plagued with health and tendon problems, went into a serious decline following the 1984 season. He came back in 1987 with a third place in the Vuelta. But he was never again the rider he had been in 1984, a rider who could toy with the peloton almost at will. His 1989 was sparkling, with a second win in Milano-San Remo, the Giro d'Italia and a second place to Greg LeMond in the Tour de France. 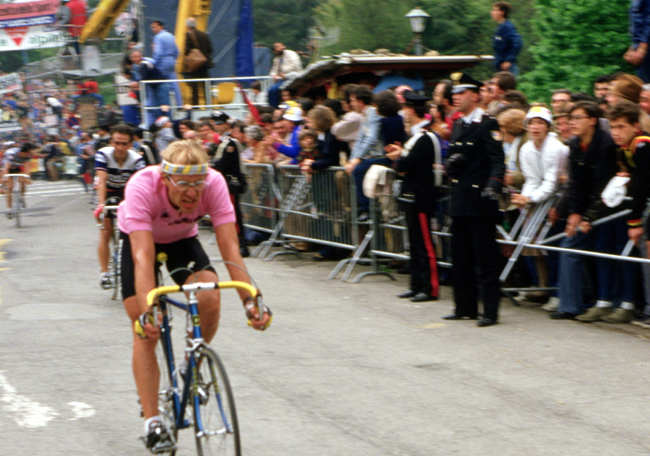 Going into the final time-trial stage Fignon was ahead by 50 seconds and looked like the 1989 Tour's winner. But in the final time trial LeMond uncorked one of cycling's greatest rides. LeMond ultimately beat Fignon by 8 seconds, still the closest margin in Tour history. Fignon was unable to repeat his 1989 triumphs and when the drug EPO arrived, which Fignon said he would not take (though he did take cortisone and amphetamines, two popular drugs of Fignon's cycling cohort), his career as a winning racer was over. Fignon died of cancer in 2010. Fignon wearing the maglia rosa riding the stage 3 time trial to Assisi in the 1982 Giro d'Italia. 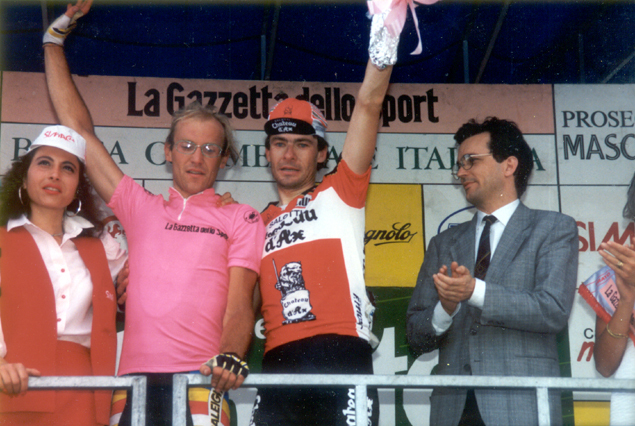 Three first pink jerseys of the 1982 Giro d'Italia, from left: laurent Fignon, Bernard Hinault and Patrick Bonnet. Fignon finishes stage 5 at Blockhaus in the 1984 Giro d'Italia. Fingon wins stage 20 of the 1984 Giro d'Italia. Laurent Fingon after winning stage 20 in Arabba of the 1984 Giro d'Italia. 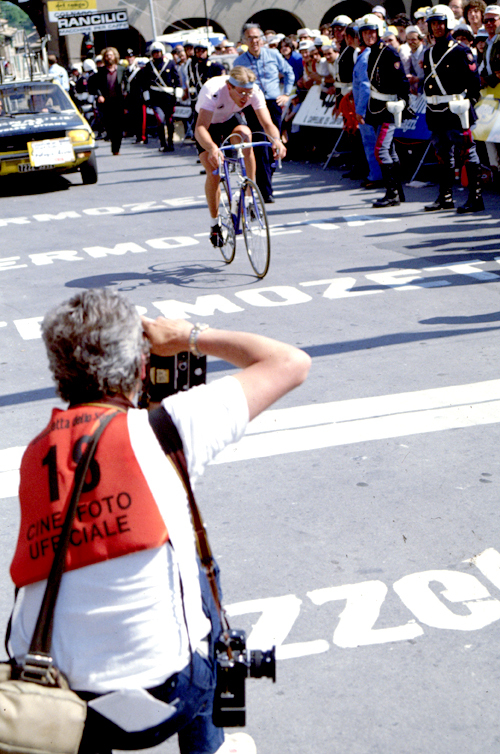 He now led Francesco Moser by 91 seconds. 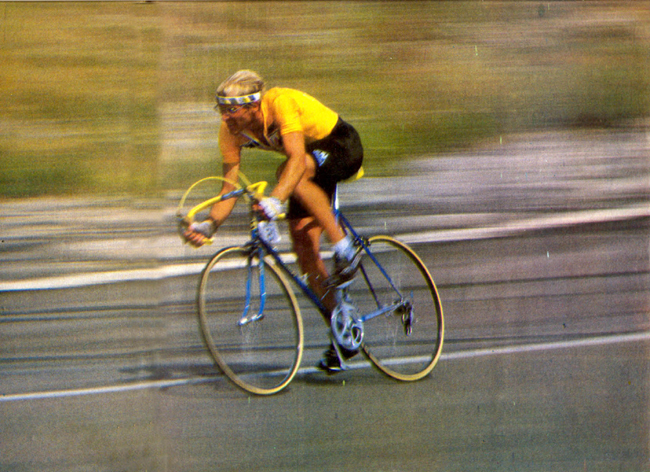 Fignon riding the 1984 Tour de France prologue. 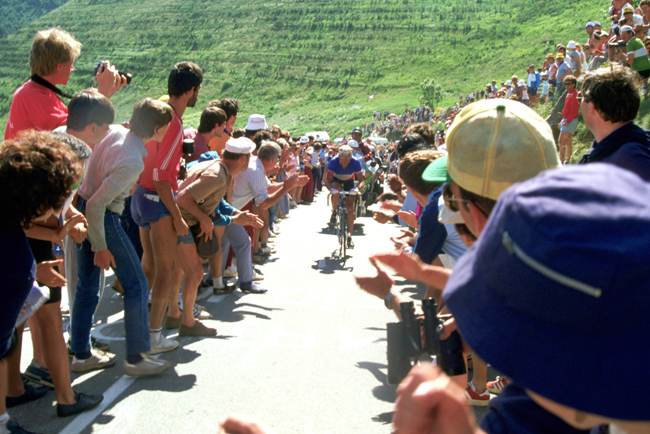 Fignon races up l'Alpe d'Huez in stage 17 of the 1984 Tour de France. Luis Herrera is about a minute up the road, but Fingon will end the Tour in yellow. 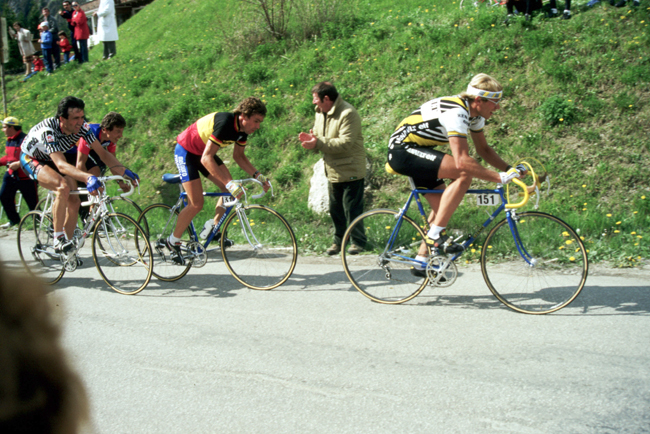 Pascal Simon leads Fignon (in yellow) in stage 18 of the 1984 Tour de France. 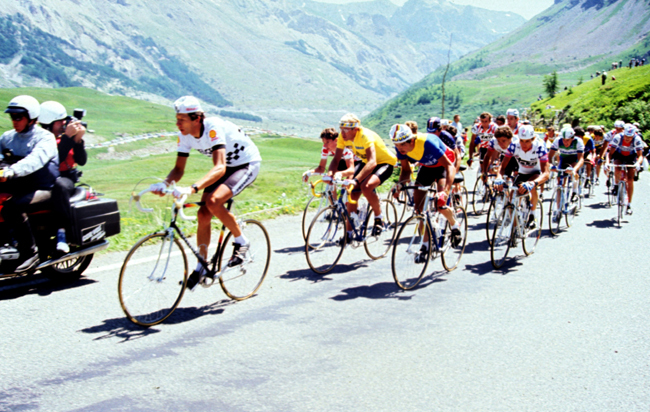 Fignon would lead second-place Bernard Hinault by 8min 39sec at the end of the day. 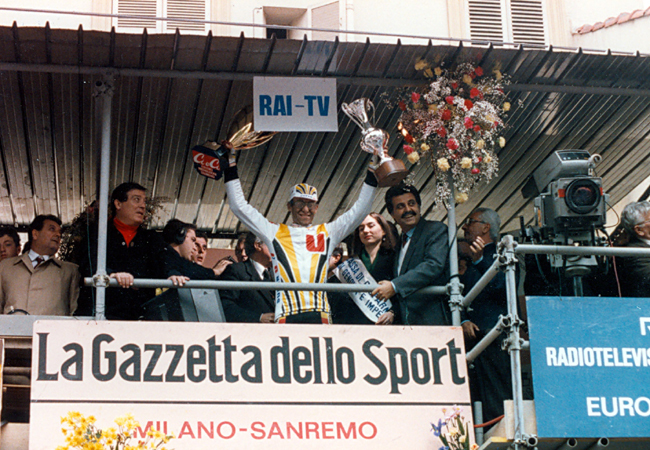 1986 Tirreno-Adriatico, stage two. It looks like Fingon is riding into Gubbio's town center. 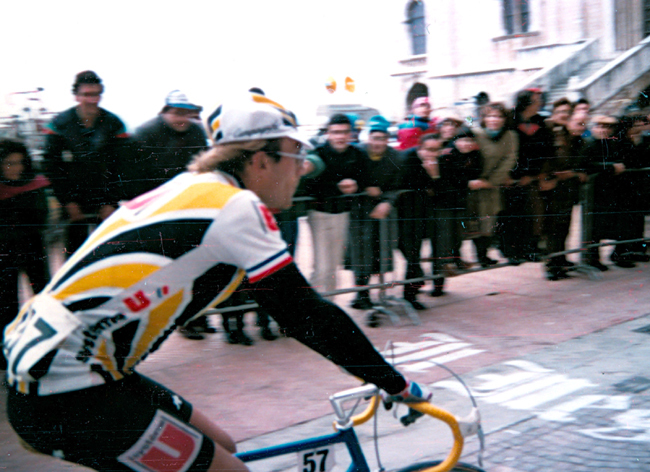 Fignon ready to ride the San Benedetto del Tronto stage 6 time trial in the 1986 Tirreno-Adiratico. Fingon time trials up Mt. Ventoux in stage 16 of the 1987 Tour de France. 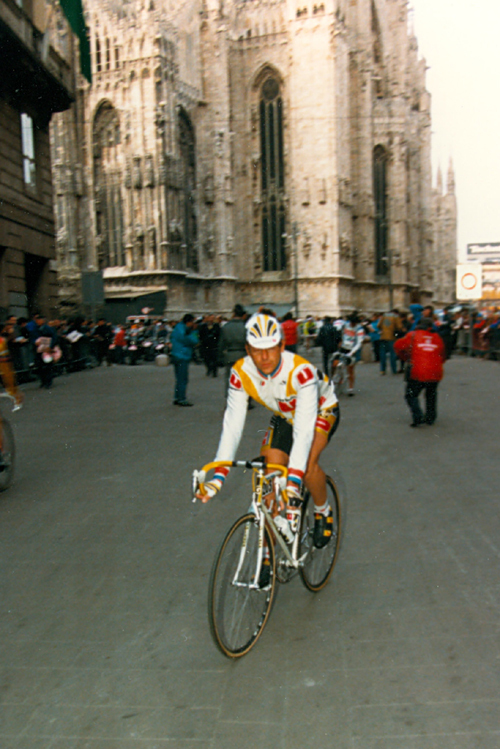 Fingon at the start of the 1988 Milano-San Remo. 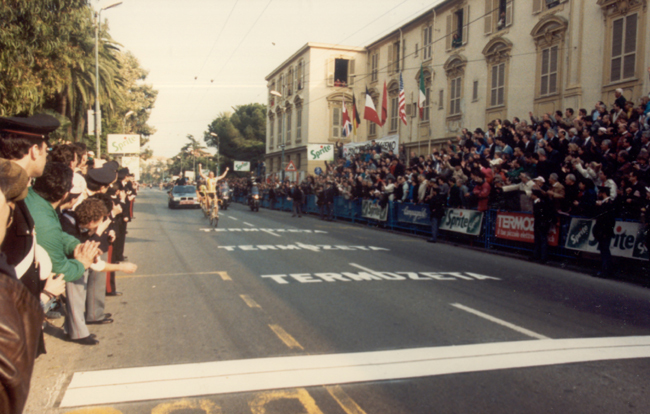 Fignon's comeback: Here he wins the 1988 Milano-San Remo. Two in a row! 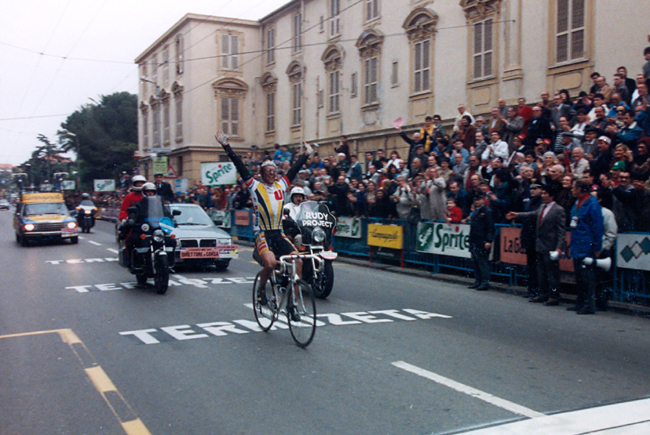 Fignon wins the 1989 Milano-San Remo. 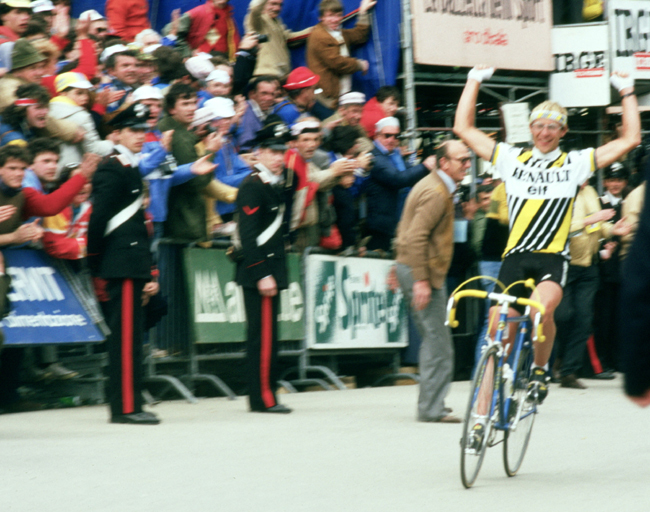 Fignon savors his victory in the 1989 Milano-San Remo. 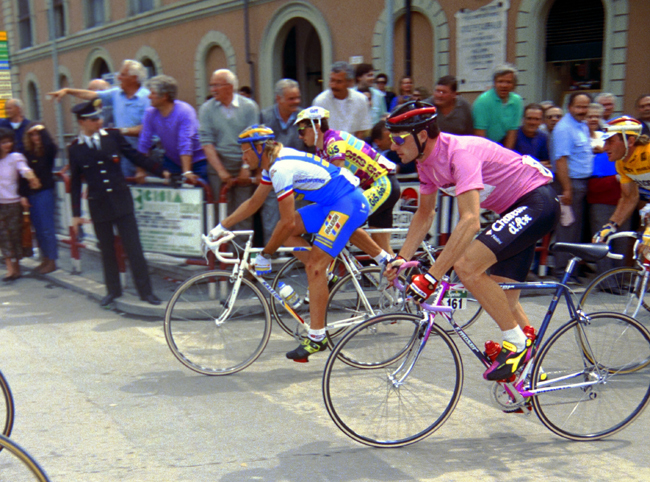 Fignon in pink alongside Gianni Bugno at the 1989 Giro d'Italia. 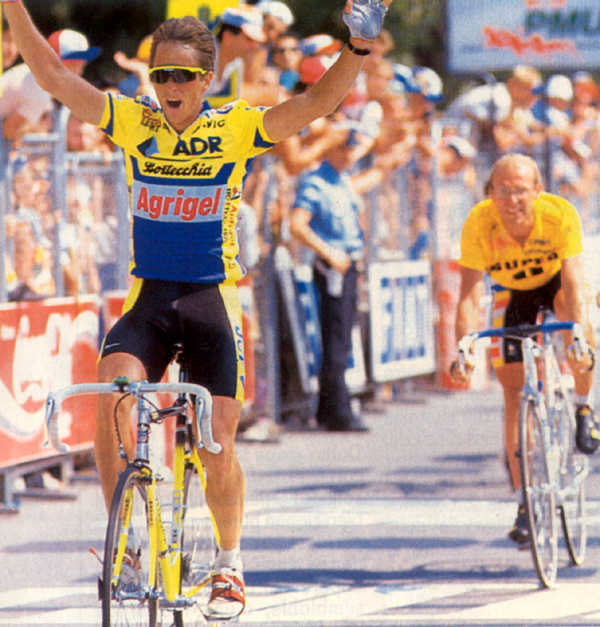 Fignon outsprints Maurio Fondriest to win stage 20 of the 1989 Giro d'Italia. 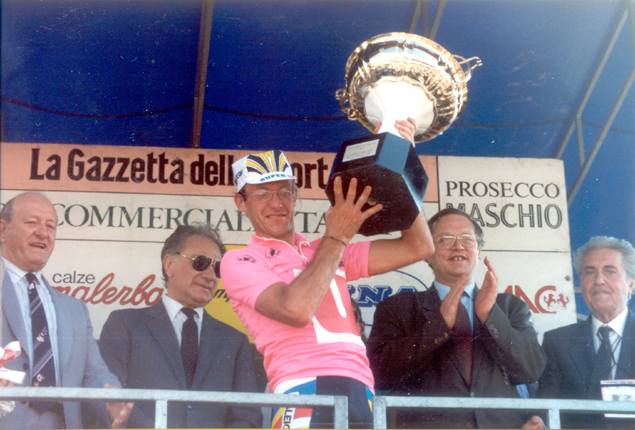 Fignon wins the 1989 Giro'Italia. Two very closely matched racers. Here LeMond beats Fingon to win stage 18 of the 1989 Tour de France. 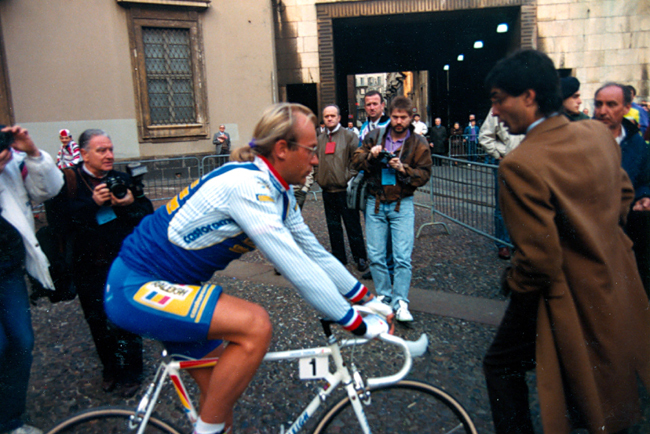 Fignon at the start of the 1990 Milano-San Remo. 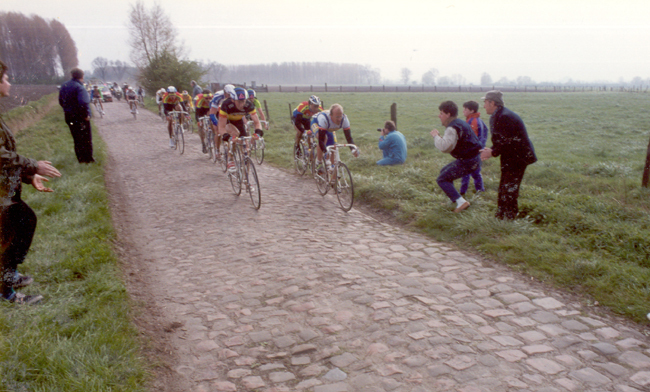 Fignon leads on the cobbles of the 1990 Paris-Roubaix. Fignon in the starthouse of stage 1 of the 1990 Giro d'Italia. 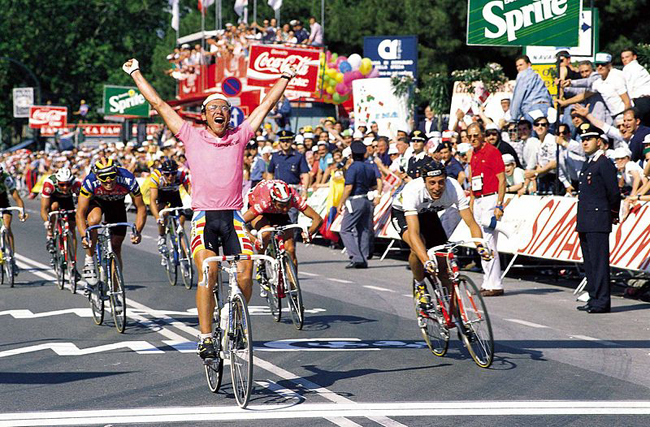 Fignon and Gianni Bugno (pink jersey) ride stage 6 of the 1990 Giro d'Italia. 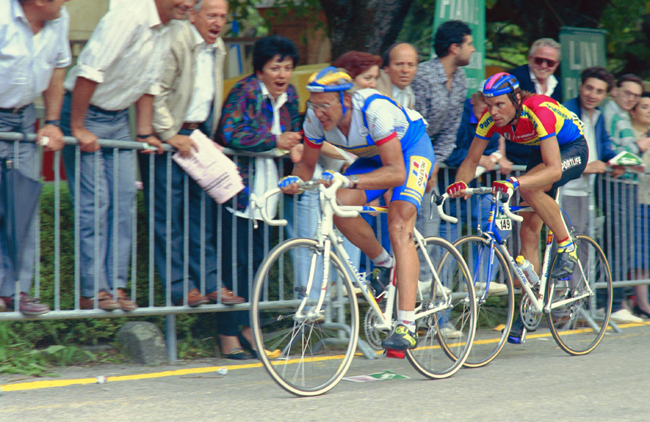 Stage 7 of the 1990 Giro d'Italia: Fignon races to Vallombrosa with Gert-Jan Theunisse on his wheel.